Thanks to all our delegates for a great meeting! PDFs of the talks and poster presentations are now available. Powered by mass accretion onto super-massive black holes, Active Galactic Nuclei (AGN) are undoubtedly exotic phenomena. According to most theoretical models of galaxy formation, AGN have also had a profound impact on the way the Universe looks today. However, AGN activity is, in another sense, a common phenomenon: the finding that essentially all massive galaxies host a central supermassive black hole clearly indicates that these galaxies have all hosted AGN activity at some point during their lives. Are these AGN phases a special period in the lifetime of the galaxy that require specific environmental conditions, or are they simply a random event that can occur at any time in any galaxy?  What host-galaxy properties facilitate AGN activity? 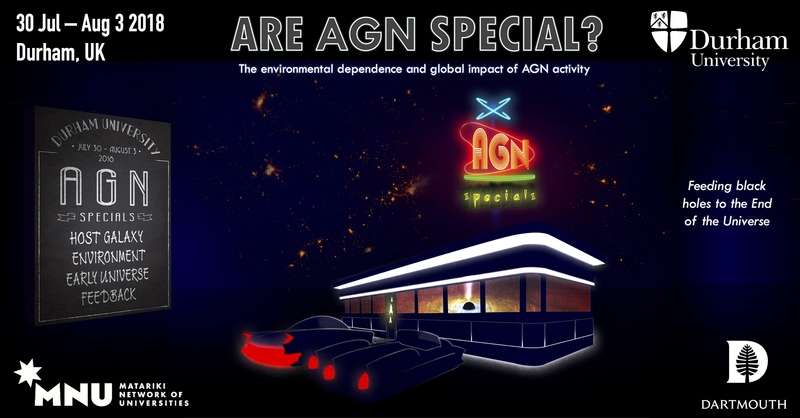  What larger-scale environments facilitate AGN activity?  Is the high-redshift Universe a special environment for AGN activity?  How do AGN shape the way the Universe looks? The workshop will be held in the historical city of Durham in England over 30th July to 3rd August 2018. The workshop will include a combination of invited, contributed, and poster talks, in addition to extended discussion sessions. The official twitter account of the meeting is @SpecialAGN18. Follow us for updates, and use the hashtag #AGNSpecial18 to spread the word!